JUMPING THE GUN Wahlberg and Berg may have spoken too soon when they predicted audiences would crave more of this picture’s mindless violence. Mark Wahlberg and Peter Berg just may be Hollywood's reigning It Couple. The relationship between the actor and the action auteur has lasted longer than many a showbiz marriage. The pair met in 2012 during preproduction for Lone Survivor (2013), discovered they had a lot in common and have hooked up for three more movies since then: Deepwater Horizon (2016), Patriots Day (2016) and now this one. The two are happily planning a future together. But more on that in a minute. First, a few thoughts on their latest, a completely fictional black-ops thriller they thought would be fun to make after the pressures of telling a trilogy of stories based on real-life tragedies. Every now and then, a work of cinema holds a mirror up to the cultural moment, even if that wasn't remotely its creator's intent. I think that's what we have here. With Mile 22, Berg accidentally taps into the wellspring of weirdness underlying life in the age of Trump: a topsy-turvy day-mare in which the White House might as well be the "Big Brother" house, and an unstable game show host has the codes to the nuclear arsenal. Not that this was Berg's pitch. That would've been inconceivable, given the filmmaker's penchant for the patriotic and his almost fetishistic obsession with all things military. Rather, Mile 22 offers an adrenalized celebration of American might, a veritable super-cut of tech-war tropes. The movie correlative to the commander-in-chief's dream military parade, it might just as aptly have been called Fire and Fury. 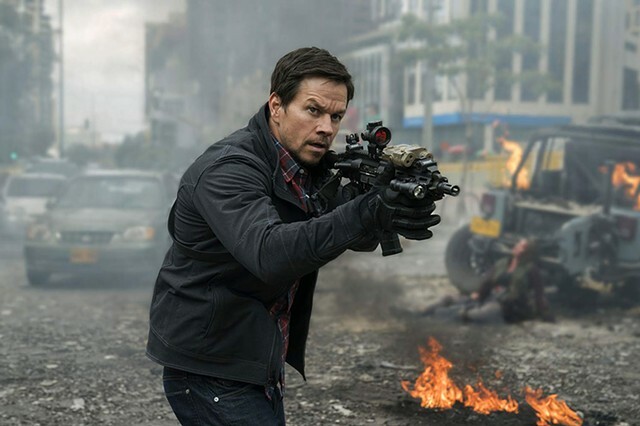 Wahlberg stars as James Silva, the leader of an elite CIA unit known as Overwatch. A generic bulletproof type with a license to kill and anger management issues, he's basically Jason Bourne without the sparkling personality. What made this movie fun for its star and director clearly was getting to play with pricey, space-age military gizmos. Silva and a mission coordinator called Mother (John Malkovich) deploy them against hordes of brown people, teaching them not to screw with the red, white and blue. Set in Southeast Asia, the story concerns a rogue cop, played by The Raid's Iko Uwais. He promises to provide the location of stolen radioactive material in exchange for asylum in the U.S. Overwatch is tasked with getting him to an airstrip the titular distance from the American embassy. Needless to say, heavily armed mystery combatants attempt to stop them. In a typical scene, a grinning Silva finger-shoots an opponent through his car window seconds before a Hellfire missile disintegrates the guy. Yay, drones! A frenetic, only quasi-coherent excuse for 94 minutes of choppily edited mayhem, Berg's latest proves both spectacularly vacuous and curiously smug. It doesn't have a thing to say other than that our weapons of mass destruction are bigger, more advanced and, you know, cooler than everyone else's, and it manages to say it with a borderline Breitbart air of supremacy. Which, I suppose, shouldn't surprise. The filmmaker has gone on record saying he modeled Silva on Steve Bannon. While we're at it, let's not forget Wahlberg has claimed the 9/11 terror attacks wouldn't have gone down the way they did if he'd been on one of those planes. So, these two were made for each other. As you read this, they're making plans to spin Mile 22 into a multipicture franchise. Yeah, that's gonna happen. Next to that brainstorm, Marky Mark saving the day on 9/11 doesn't sound delusional at all. The original print version of this article was headlined "Mile 22"